No fanfaire, George just showed up again. No idea where he's been. He's back to splitting babysitting, or eggsitting duties with Emily. The other night George caught a beetle I can't ID -- any thoughts? You have no idea just how varied the insect kingdom is until you start paying attention to a spiders web and realize that you've never seen ANYTHING that she catches before. He's about 1/3 the size of Emily and you will notice that his pedipalps are larger. Yesterday while cleaning the house a fly was killed (by me), it was a gigantic thing and I thought "why not recycle it?" so I tossed it into Emily's web and she Freaked Out, screaming "Godzilla attack!" she ran off to a corner of the roof. 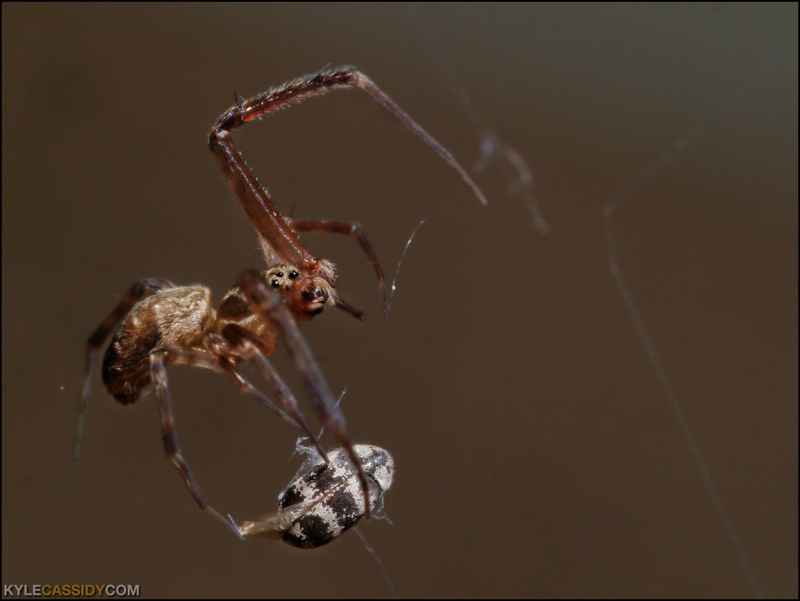 Later she came back and cut the fly out of her web and threw it on the ground like a petulant child. I've decided not to try and be helpful anymore. George finds a beetle. You may clickenzee to embiggen! I've never seen anything like that either. I'm forever trying to ID all the insects I see in the garden; it's a never-ending job. someone on the facebook has ID it as a "varied carpet beetle"
Hurrah for George! Carpet beetles eat wool. Fanfare for the common spider, by Copland? I love these spider updates. Such drama! Heartwarming moments! Bug snacks! I don't think she would recognize a dead fly as food. 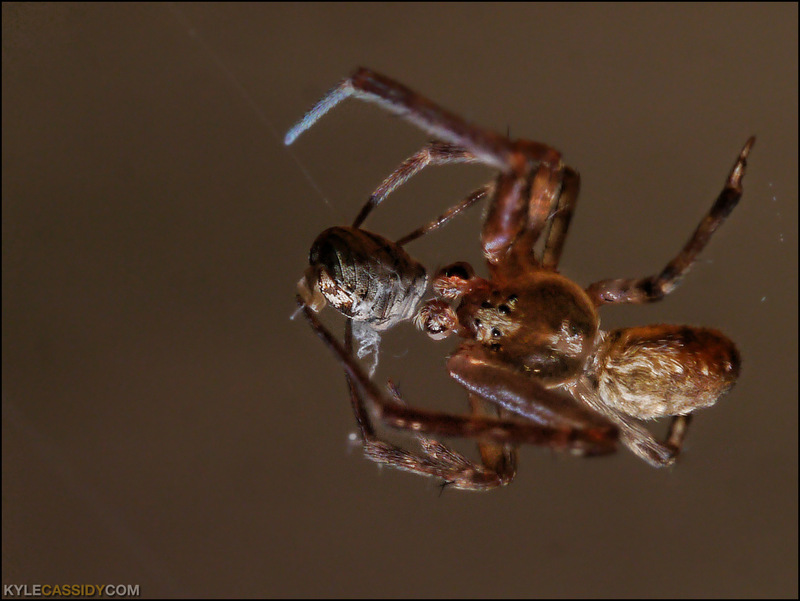 It doesn't move, and depending on how she feeds, a damaged exoskeleton might render it practically inedible.